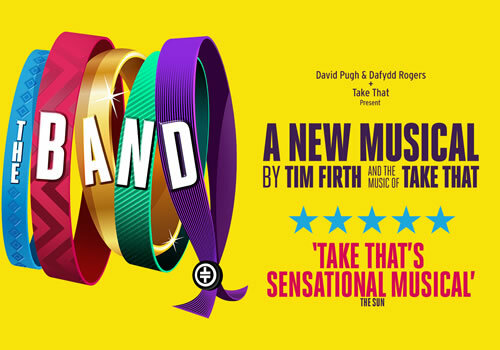 After becoming the fastest-selling touring production, Take That’s sensationally popular new musical The Band stops off in the West End as part of an extensive national tour. Playing a strictly limited 50 performances at the Theatre Royal Haymarket, the production stars the members of Five to Five from the BBC’s talent search programme Let It Shine. A hilarious story of friendship and memories, The Band takes place in 1992 and follows five 16-year old girls who are obsessed with a particular band. From here, an emotional rollercoaster ensues, as a once-inseparable group of girls drift apart over 25 years. When the girls reunite again as adults, they are determined to fulfil their lifelong dream to finally meet the band. With the band’s music becoming the soundtrack to the girls’ lives, the musical features a strong back catalogue of Take That’s greatest hits. Toe-tapping tunes include “Back for Good”, “Never Forget”, “Rule the World”, “A Million Love Songs”, “Greatest Day”, “The Flood”, and “Shine”, plus many more. Casting includes Five to Five members A. J. Bentley, Nick Carsberg, Curtis T Johns, Sario Soloman and Yazdan Qafouri, alongside Alison Fitzjohn as Claire, Emily Joyce as Heather, Rachel Lumberg as Rachel and Jayne McKenna as Zoe, as well as Faye Christall, Katy Clayton, Rachelle Diedricks, Sarah Kate Howarth, Lauren Jacobs, Martin Miller and Andy Williams. The Band is written by Tim Firth, whose latest musical The Girls embarks on a UK tour. Directed by Kim Gavin and Jack Ryder, the production features design by Jon Bausor, lighting design by Patrick Woodroffe, sound design by Terry Jardine and Nick Lidster for Autograph and video design by Luke Halls. Prepare to laugh and cry in equal measures as this smash-hit new musical takes to the London stage. The Band plays at the Theatre Royal Haymarket for a strictly limited season, from December 1st 2018 to January 12th 2019, with a gala night on December 5th 2018. The Band is recommended for those aged 10 and up.